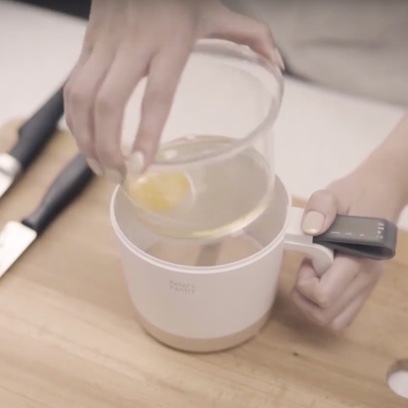 MoMA Exclusive: The right size for every liquid and dry ingredient in your recipes, the Peter's Pantry Smart Measuring Cup can replace your traditional measuring cups with a digital readout in grams, ounces or milliliters. Just start to pour or spoon in whatever you need to measure, and watch the numbers rise. Bake pastries like brownies and pâte à choux, create pizza or quiche dough, and make precise sauces—every recipe becomes more accurate and easier to complete when you can easily weigh or measure multiple ingredients in the same container. Great for enabling accuracy when you are converting metric recipes to imperial units (or vice versa), the Smart Measuring Cup switches between modes at the touch of a button and also has separate settings for water, milk and oil to ensure precise measurements for different liquids. The two-part cup design delivers accuracy even when you hold it in your hand. Includes removable ring that acts as a splash guard. Made from ABS and silicone with a white cup and light gray handle. Includes a clear removable lid. Requires three AAA batteries, included. To clean: Base cover is washable with dish soap and water after removing from the main body; main body should be cleaned with a dry cloth or wet wipes only. The inner cup is removable and is dishwasher-safe. MoMA has a history of documenting and exhibiting life-improving designs to bring them to the public's notice. The Museum staged exhibitions throughout the 1940s dedicated to useful objects and celebrating the roles these humble designs play in our everyday lives. 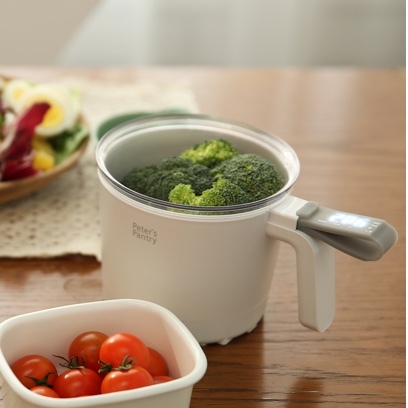 The Peter's Pantry Smart Measuring Cup uses precise digital technology that eliminates many time-consuming and imprecise steps in the cooking-prep process, from having to use and wash multiple measuring cups to calculating metric and imperial conversions. The Cup's innovative technology enables you to not only measure volume but also weight—another function that conventional measuring cups lack. 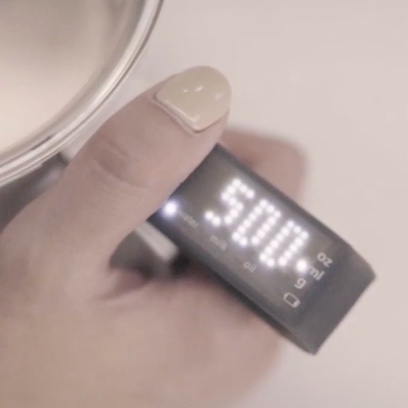 The Smart Measuring Cup can replace your traditional measuring cups with a digital readout in grams, ounces or milliliters. Just start to pour or spoon in whatever you need to measure, and watch the numbers rise up to 17 ounces or 2.2 pounds. Separate settings for water, milk and oil ensure precise measurements for different liquids.